Peter Helliar’s It’s a Date has picked up the Best Scripted Format Award in the International Format Awards at MIPCOM 2013 in Cannes. The Princess Pictures Production is produced by Laura Waters and Andrea Denholm. Co-producer is Peter Helliar, series producer is Paul Walton, ABC TV executive producers are Debbie Lee and Brett Sleigh, and directors are Jonathan Brough and Peter Helliar. In August Helliar told TV Tonight he was hopeful the show would generate international format interest. “Conversations are happening. There had been interest from the UK but the States is obviously the big one and sometimes they like you to go to them first. But we wanted to have it made before we presented it to them,” he insists,” he said. 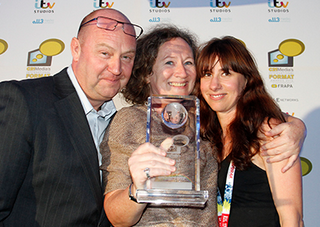 The winner of the award for best brand-driven format was Be the Boss from All3Media International; the winner of the award for best comedy format was Hotel Zimmerfrei from Nordic World; and the winner of the award for best factual entertainment format was Gogglebox from All3Media International. The winner of the award for best multi-platform format was Pissed Off from ITV Studios; the winner of the award for best competition reality format was Mentor from Banijay International; the winner of the much-coveted award for best studio-based gameshow format was Take on the Twisters from ITV Studios. I recently binged on this show via iview and thought it was well written, well cast and well acted. It kept getting better as it progressed and loved how moments between episodes intersected although nothing significant came out of it. Not sure they can wring out too many episodes in this format though. I thought this was a really sweet show. It showed love from many different angles and quite a few brought tears to my eyes. Well done all involved. Good to see something different on the box.